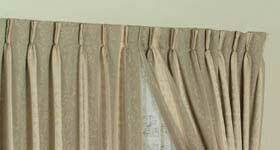 Pencil Pleat heading is a gathered heading allowing you to draw (expand or reduce) the width of the curtain to suit your window width. Pinch Pleat is a more tailored finish, giving you a more formal look, the actual pleat as you can see in photo is a triple pinch, ie it has 3 pleats then a space. Please note on purchasing Pinch Pleat curtains they can not be adjusted to fit the windows like Pencil Pleat Curtains.They are a tailored finished size of 120 width, 180 width, 240 width and 300 width. 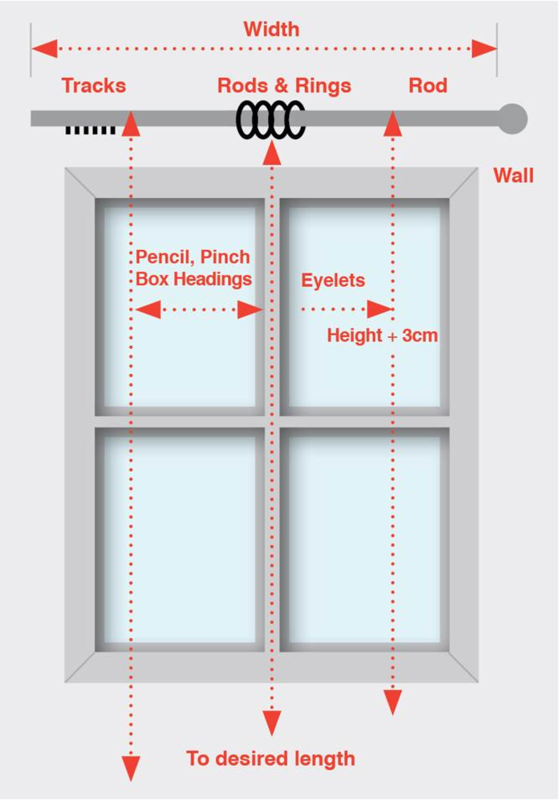 If your measurements do not meet these requirement's then you will need to have a Pencil Pleat curtain where you are able to expand or reduce the curtains width. If you have selected your Curtains of choice and decided on a Track or Rod to hang them from it will be easy to take measurements. Eyelet Curtains can only be hung on a Rod. Measure the Width of the rod from end to end. Please note that most Eyelets are labelled as the flat width of the curtain. For the Height measure from the top of the Rod down to your desired length and add 3cm. This is important as the top of your Eyelet curtain sits higher than the Rod. Pencil, Pinch and Box headings can be hung from either a Hand or Cord Drawn Track or a Rod and Ring set. If you are using a track measure the Width from end to end. You may want to add some to wrap around the brackets at each end (Returns) or for the crossover in the middle (if you have a cord drawn track). For the Height simply measure from just above the top of the track down to the desired length. For a Rod and Rings set measure the Width of the Rod and for the Height measure from the bottom of the Rings down to the desired length.Please note that Pinch and Box Pleat headings require additional width (add 5%) to compensate for creepage* when hung. Please see further information below or contact us for additional information*. Measure width from one end of track to the opposite end. Measure from the top of the track to the desired finished length just off the floor. Measure width from one end of track to the opposite end. Add for returns and centre overlap. Measure width from one end of rod to the opposite end, not including finials. Measure from just under the rod to the desired finished length just off the floor. Measure from the top of the rod to the desired finished length just off the floor. Rod only can be used for Eyelets (without rings). Measure from under the large ring to the desired finished length just off the floor. For Eyelets measure from top of Rod to desired finished length and add 3cms.